Has anyone attempted to fit an outboard motor to the Skerry? I have seen boats with a removable spar to which motor was clamped. I am thinking of some kind of well - any ideas?. Hi Derek, I was talking to a friend only today about this. I have an old Yamaha 2 hp outboard and considered using it on the Skerry. I haven't done so yet and one of the options I've now discarded - mounting it in the boat through a box. I'm not prepared to make another hole in the hull now she's finished! The other option was a bracket to fit across the rear of the boat with the motor off to one side and counterbalanced on the other probably.The bracket will need to be an odd shape though as it's not a very long shaft outboard and as yet I haven't taken any measurements , just made some rough drawings. With this arrangement I could either fit a longer tiller on the outboard so that I can balance the boat better or lock up the outboard so it can't turn and use the Skerry rudder and tiller. At the moment I don't really need it but I'm getting older . . . Mounting a motor on the Skerry is a bit tricky as she has no transom. People have fitted brackets to the boat so that the outboard hangs over the side and one ingenius Skerry builder, Zach Weist in the USA, has actually fitted a trolling motor to his rudder assembly. Building a motor well box with a mounting thwart through the aft seat/bouyancy chamber, off set to port or starboard sounds like the best permanent solution, but bear in mind that this would seriously reduce seating space aft and drastically affect performance. 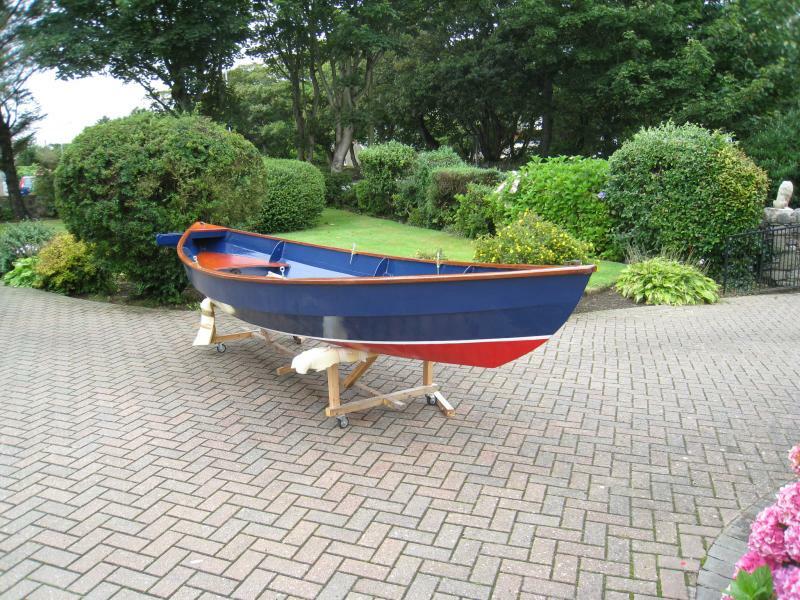 These boats are designed to row very well and there are plenty of stories of people rowing long distances with no trouble at all - see Yambo's post here (ok he does admit to getting a tow home...but the row out seems easy enough!). 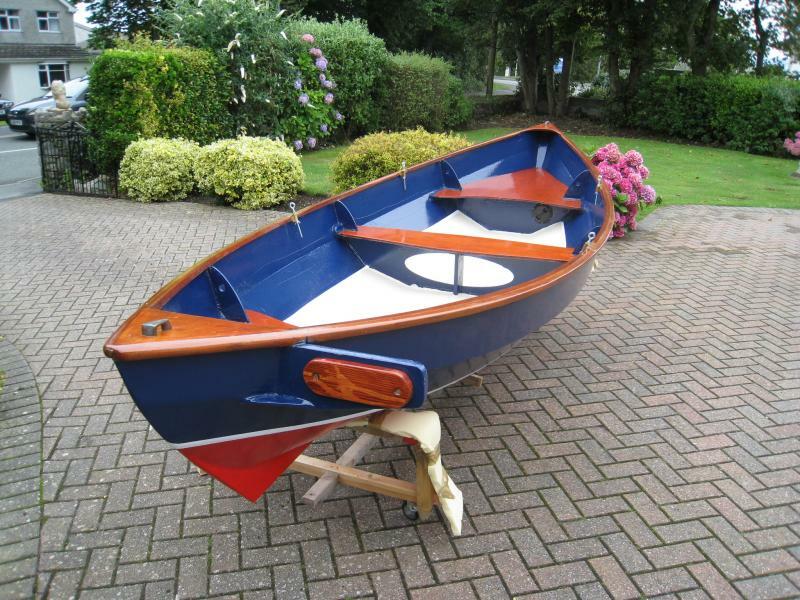 If a motor is a real issue, then perhaps look at a boat that can accommodate one more easily such as the Skiff ? Thanks to Yambo & Wilddog for their prompt response. I already have the Skerry kit bought for me as a retirement present by my employers and I am just about to start building. I guess I need to start with deciding on the motor - maybe a small electric? and then seeing whether the size of well required will fit into this area without to much of a penalty in looks and performance. When finished the boat will be auctioned and the proceeds donated to charity - last time it was a Wood Duck canoe which raised money for help the Heroes - this time it will be McMillan Nurses. I live on Anglesey and the boat will have higher value if it can be motorised to cope with tide and weather conditions here. I intend to make a CAD drawing of my idea followed by a cardboard mockup before I start cutting up Fyne Boats beautiful panels. What a great idea to auction the boat for Charity! Let's hope it raises lots of cash! The other option may be to modify the central seat and built an outboard well just behind the daggerboard case. It will make a mess of the central rowing position, but if oars are required, the boat can always be rowed from a forward rowing position. The issue that I see is that what ever you do, you need to select a motor with a very small footprint and a very short drive shaft. Space inside the boat notwithstanding, the Skerry only draws 5 inches, so there is actually not a lot of depth from the plane of the seats to the bottom of the Hull to work with. Any motor will be dangling pretty deep in the water which may compromise the boat's ability to 'creek crawl' and beach, which is what the Skerry is designed to do. In this case, fitting the trolling motor to the drop keep - which can be lifted, makes a lot of sense! As you pointed out there is very little vertical space under the seat and the area available in plan view at seat level rapidly diminishes as you drop down. Many thanks to yourself & Yambo for your help in coming to this decision. The Skerry has been great fun to build and my thoughts on the process are on the bui ld progress log pages here. It's a warts and all account as I'm afraid I've made a fair few mistakes, but I think this is normal for a first project! I have not sailed a Skerry but I'm an experienced sailor. I have crossed the atlantic in my double ended 31 footer. * The engine size to use on a skerry would be the smallest possible, that is usually 2 HP or 2.5 HP depending on brand. That will probably be enough to reach close to the skerrys top speed. * My Suzuki 4-stroke 2.5 HP uses 0.23 litres / hour on half speed. Double those digits for full throttle/speed. The weight is 13 kg + 1 litre of fuel in the tank. A 2-stroke outboard would weight even less (and be smaller) but the fuel usage is ~25% greater. 1: Quick fix: Place an engine mount directly onto the rudder. You will do the steering with your normal rudder tiller. The engine changes angle then the rudder does. The outboard engine mounts is usually able to lift out of the water then the engine is not in use. One of the downsides is that your steering while sailing will be heavy with an engine hanging on the rudder. But its always possible to take the engine off and place it in the bilge as it is not that heavy. 2: Better option: Build some kind of construction hanging behind the rudder. I have a welded stainless D-skaped construction on my sailboat, hanging behind my rudder, where my wind wane is mounted. On a skerry I would probably do this in plywood. Something thats removable on days when you imagine the outboard is not needed. 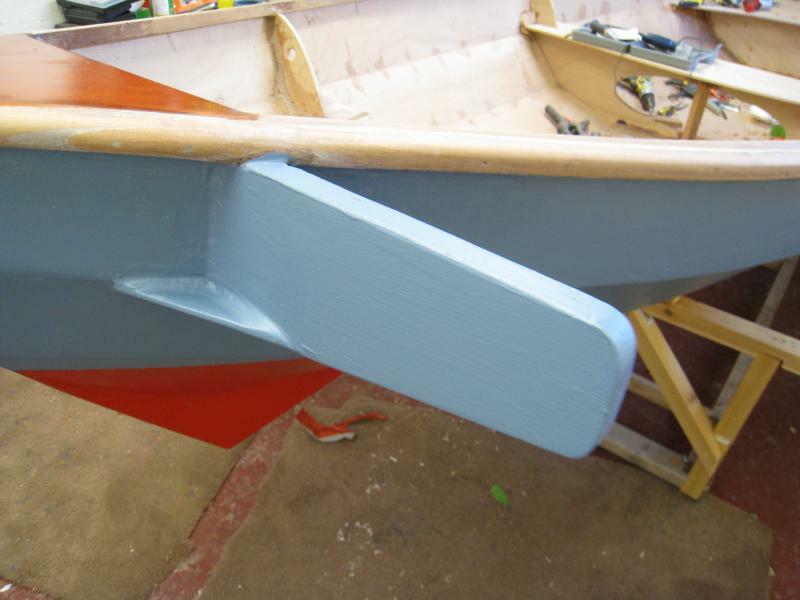 If you varnish it it might even look OK.
As I see it, making an inboard engine out of an outboard (in a box) is not practical in a boat like the Skerry that you are suppose to launch by hand, drag onto beaches, etc. There is also a chance of getting smelly exhaust smoke into the boat. The reason im looking into outboards on a skerry is that I would like to take it on the european inner waterway system, and you need to be a motored craft to be allowed to use the locks. Back again on Skerry motor mount- things have moved on. 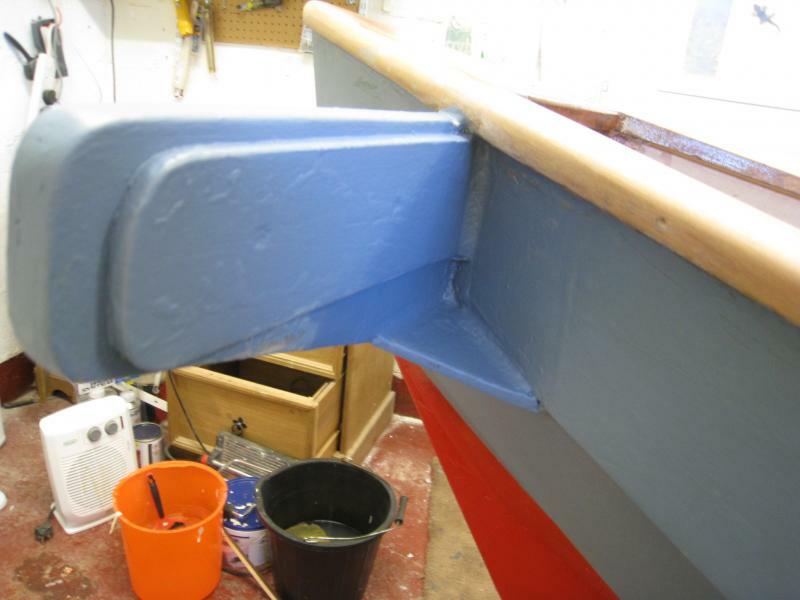 After a lot of thought and discussion I fitted a fixed mounting beam on the starboard side. The beam from " x " solid timber passes right through both sides of the boat under the edge of the rear seat. Where it penetrates the hull its reinforced with shield shaped 6mm ply doublers. The mount places the outboard tiller convenient for the right hand of the pilot who sits offset to port and thus balancing engine weight. It is going as a display in a new resturant - shame but everybody wins - Charity gets its cash, resturant get a cheap bioat and I have had 18 months entertainment. I am thinking of some kind of well - any ideas????? ?